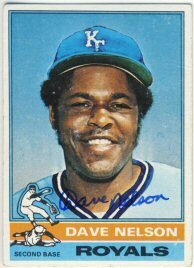 Today I received a return from Dave Nelson. I sent my request in care of the Milwaukee Brewers about three weeks ago. He signed his 1972 and 1976 Topps for me. 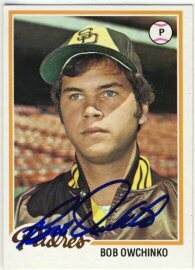 This makes number six out of my goal of ten signed 1972 Topps for the year. I've received two returns this week. 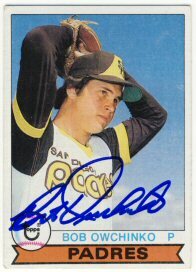 On Tuesday, I received a return from Bob Owchinko, who was kind enough to sign his 1978, 1979 and 1985 Topps for me. 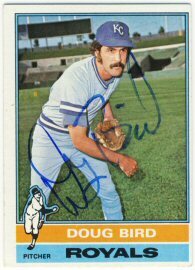 I received my 1976, 1978 and 1979 Topps signed by Doug Bird in today's mail. It looks like Sunday will be a rainy day. Maybe I'll take that opportunity to send out some more requests. 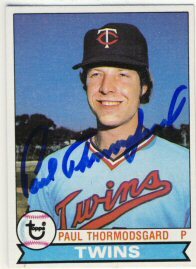 Today I received a quick return from former Twin Paul Thormodsgard, who signed his 1978 and 1979 Topps for me. I wonder if Mr. Thormodsgard still throws. The Twins bullpen could use him. An 0-7 start this year. Brutal. After posting my first quarter goal updates, I decided to finish one up. I had already gotten two more 1958 Topps cards for my set, but my goal was three. I used some Ebay bucks to help reduce the cost of this, which wasn't too bad to start with. 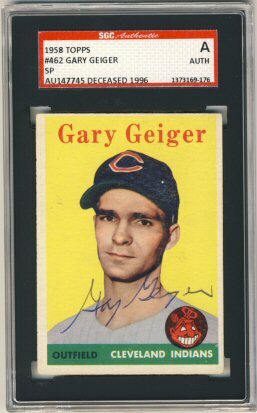 I think I have 126 cards from the 1958 set that I don't have signed. Mays and Koufax off the top of my head. Ouch. Now I have to get going on my 1965 Topps goal. I set a goal of five more for the year, but haven't gotten any. 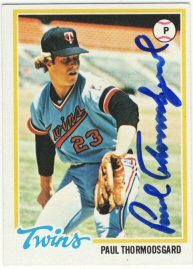 Maybe this weekend I'll review my list to see if there are any more ttm signers that I can try to get. A day after complaining that I've only received one return from spring training, I received another. 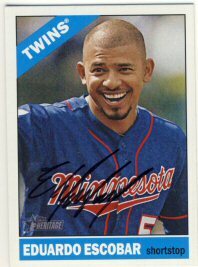 Eduardo Escobar signed his 2015 Topps Heritage for me. Hopefully more will come back soon! 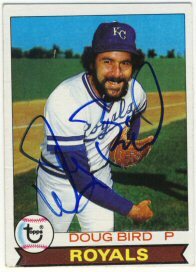 I also sent out five new requests today, all for my 1978 Topps set. I haven't done much work towards my goals in the last month or so. I did send a dozen requests to Twins spring training and have only received one back. I expected to do much better than that, but maybe some of those will come back during the regular season. Goal - Add 3 cards to my 1958 Topps set. - So far I've added two, so I shouldn't have a problem getting one more this year. Goal - Add 10 cards to my 1963 Topps set - I'm at nine so far, so this one will be easy. Maybe I set this goal too low. Goal - Add 5 cards to my 1965 Topps set - I haven't added any, so I need to get going on this one. 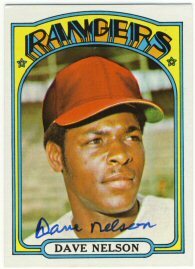 Goal - Add 10 cards to my 1972 Topps set - I'm at five, so this should be an easy one too. 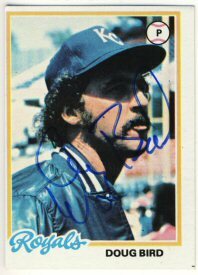 Goal - Add 75 cards to my 1978 Topps set - I'm only at eight, so I have a long way to go. It's just a matter of taking the time to write some letters. For some reason, I can't get motivated on this set. 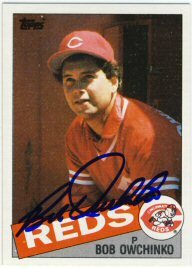 Goal - Send out 150 TTM requests - I'm at only 27 requests do far this year. I'll need ot pick up the pace quite a bit to meet this goal. Goal - Get two bobbleheads signed - Since I didn't go to TwinsFest, this one will be tough. I really don't have that many bobbleheads left that need to be signed, but I did just buy one on Ebay that I'll post about when I receive it. Goal - Get three magazines signed TTM - I haven't sent any, so I need to get going on this one. That's it for Q1. How is everyone else doing on their goals?